Two weeks ago we finished packing our bags, said goodbye to friends, and loaded into two Suburbans to make our way to the airport. The first red flag occurred when we realized that the cars didn’t have the car seats we requested. 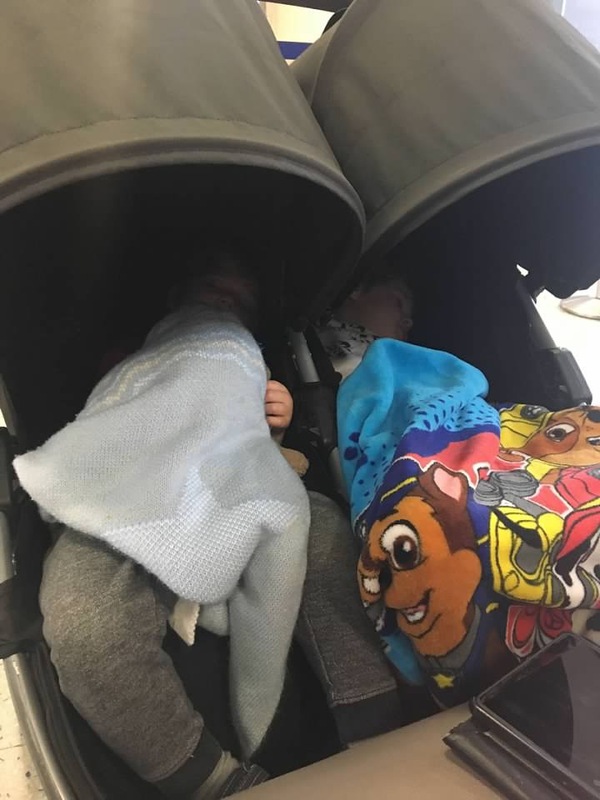 Usually I wouldn’t even think about driving on a Georgian road without car seats but it was in the middle of the night and a decision had to be made, and to be honest it wasn’t even that difficult of a decision because I wasn’t about to install two car seats right then. The drive went fine and the kids sang Georgian songs all the way there, to the delight of our driver. The car behind us was hauling our 7 suitcases, car seats and stroller. It only takes about 35 minutes to get to the airport in the middle of the night, which for me is just enough time for the adrenaline to start to fade and my eyes to get heavy. No time for that! When we parked and unloaded, JR and I counted the bags and we were one short. Holy panic. We cut it close when we arrive at the airport because I want to avoid waiting around for an extra hour before such a long day, but it was quickly clear to me there wouldn’t be enough time for a driver to go back and pick up our bag and then return to the airport before we departed. We’re standing outside the airport, it’s cold, the kids are confused and I didn’t know what we should do. We asked one of the drivers to call the guards at our house to ask if there was a spare suitcase hanging out on our porch that was mistakenly left behind. Just as he got on the phone, someone came up to us and pointed back about 30 feet away at a lone suitcase hanging out on the sidewalk. Somehow the other driver unloaded it but missed bringing it to the rest of the group. Crisis averted. The flight to Munich was fine. It’s just under 4 hours and the kids mostly ate breakfast and watched shows. I talked up our 3 hour layover in Munich, telling the kids how we’d find an awesome playground and have time to play. There was a play area we’ve stopped at on almost each flight, shortly after we made it through security. It’s okay but not as nice as others they have, so we didn’t stay long. We picked up some soft pretzels on the way to our gate area, hoping we’d have one of the newer, bigger play areas close by. We walked and walked and walked. We had to go through another security screen (this was our third time that morning. They asked us a bunch of questions, then sent me and the kids off to one side while JR had to go through the whole deal again). After that, we were at some random lone gate at the far end of the airport. No food other than vending machines, and certainly no play area. 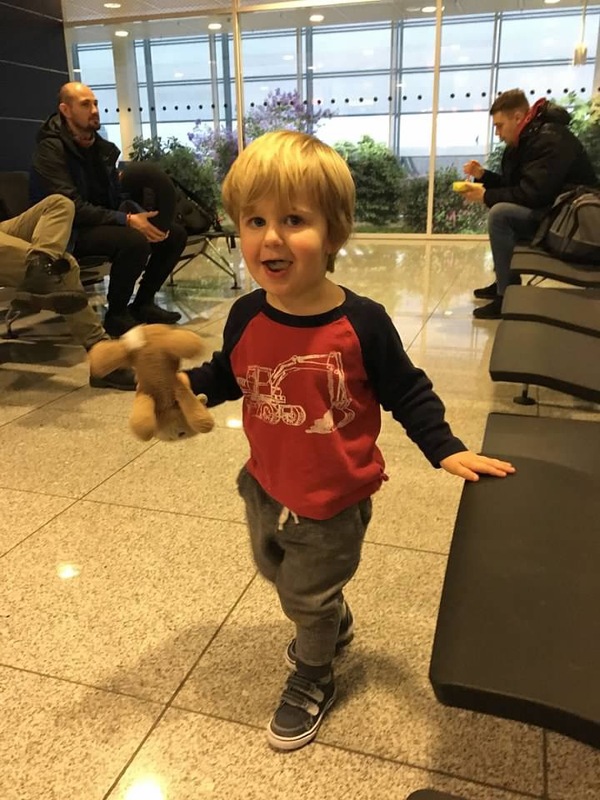 I was disappointed – Munich is usually a great layover spot for us but due to our gate location it was a bummer this time. The kids barely noticed and chased each other around the waiting area while JR went off in search of more hot pretzels to tide us over. Because I was on a med evac ticket and we couldn’t get seats together, we qualified for extended economy seating for the flight to Newark. I definitely noticed and appreciated the increased leg room. We all fell asleep shortly after takeoff and that got us through the first 2 hours of the flight. The remaining 6.5 hours, however were ROUGH. 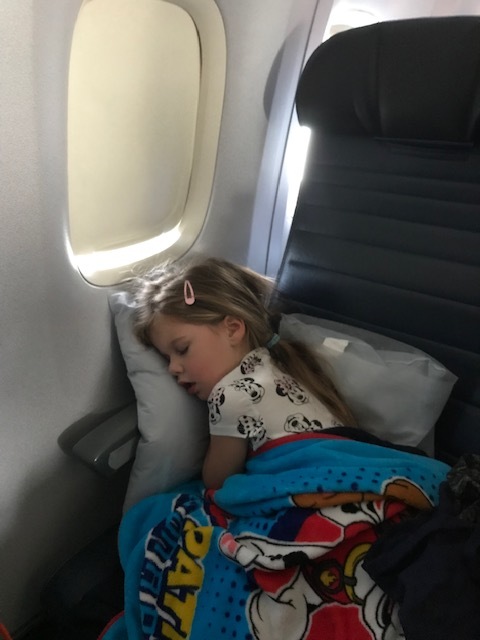 Abby did mostly fine, she watched the in-flight movies and her iPad, had a ton of snacks, and didn’t complain too much. William was a different story. He’s not that into shows or the iPad yet and he refused to let me sit by him (which meant JR didn’t really get a break the rest of the flight) and required near constant entertainment. Not easy to do when you are confined to a small space and trying to make minimal noise to not disturb those around us trying to sleep. You can tell yourself “it’s only one day, this will end eventually, people deal with much more difficult things than this” and then you look up and only 3 minutes have passed since you last looked at the clock. And then if you’re me, you hate everyone and question all life choices that led you to be trapped on an airplane with two small children for another 6 hours. We landed in Newark grateful to be in the America finally, but that passed kind of fast because to be honest, the Newark airport is kind of awful. We waited a lifetime for our bags. We paid a well-worth it $20 for a porter to help us collect them and transport them through passport control and customs. I highly recommend doing this because it allowed us to pass two lines, and it was a bit of a walk from point A to point B, and would have been very difficult even with both of us, considering the amount of luggage we had plus the kids in their stroller. We rode a tram to our gate and then had to go through security for the FOURTH time. The line was long and William had a dirty diaper. I asked the first TSA agent if they had a family line. She gave me a ‘you must be joking’ look and then shook her head no. She did take a moment to ask me “So, when do you blow up?”. I can only guess she meant when am I due to have this baby? Although no one has ever asked me in such flowery terms before. After winding through the aisles we asked a second agent if we might be able to bypass the line due to William’s diaper and she very nicely let us move to the front. The next agent spent a few moments looking over our boarding passes and IDs, and while she did I filled JR in on what the previous lady had asked me. The woman with our IDs looked up and said “that’s not the kind of joke you want to make in an airport.” Um…yeah, got that, thanks. I’m just relaying WHAT YOUR COWORKER JUST SAID TO ME TWO MINUTES AGO. It was around this time of hating everyone and everything that I added Newark to my list of places I plan to never return. Also while going through security they made me empty all of our water bottles (including the kids – usually they just take them to the side and check them?) and they told me to pull all of the food out of our bags. I was incredulous. We had food shoved in every nook and cranny of our 3 carry on bags. I’ll note again this was our FOURTH TIME going through security for the day. Needless to say I was grumpy and hungry when we finally made it to our gate area to find a restaurant. Abby was passed out in the stroller, but William colored happily while JR and I gorged on chicken fingers and mozzarella sticks. The two appetizers, grilled cheese for William, and two soft drinks totaled over $50. Missed you, America! We had more than 3 hours to wait after we finished eating. JR, being a super person and having more energy than me, pushed the stroller around until both kids passed out. It was a long layover without much to do and we were exhausted. We were in such a state of mind that we actually had a conversation about not bringing the kids back with us to Tbilisi since we’re only planning to be there for like 6 weeks or so and didn’t want to put them (or us) through the experience again only to have to have to do it all over again when we come back this summer for home leave. While I was making my points, JR said that we really shouldn’t make any important decisions given our lack of sleep. To be continued, sir. So finally it was time to board our third and last flight to Cleveland. Both kids were still sound asleep. I carried Abby on the plane and he grabbed William (while simultaneously collapsing the double stroller – impressive feat) and we made it on our last flight. Abby laid across two seats and slept the entire way, and William slept on JR’s lap until the last 5 minutes. Even though JR’s arms were numb, we couldn’t have asked for more at the end of the day. My parents were waiting to pick us up and the kids perked up when they saw them. It helped that Nana had promised to have Christmas cookies and juice for them. All of our bags arrived and just one hour later we were home sweet home for the next 3 months! Good thing you were able to get ticketed and out of there before the shutdown. We were told my med evac was safe, but it was down to the last day before we were certain Justin could travel with us on his R&R ticket. Such a mess!